what error are you getting? I have used above code in Swift4.2 and its working fine. Note that if you try to use the Swift filename in your import, you will get the error "Expected ';' after top level declarator". in your Swift file after "import Foundation". Wow, great catch! Small question: Is there anywhere I can see what that project name is? I tried what you suggested and am still getting errors so I'm worried I might have the project name wrong. I just would like to add a note that if your project name has any white space or special character you have to replace them with underscores, like "My App" would be "My_App-Swift.h"
Hi @Bill how do i use swift library through cocoapod in my objective c project...? How does this work in a Framework target, can you just add #import <ProjectName/ProjectName-Swift.h> to the umbrella header? Why is this so hard and poorly documented? @uchuugaka it's not that much hard. First time you can feel a bit pain and then later you would be getting mastery on it. I have used #import "SCLAlertView-Swift.h" in .m and I getting error: SCLAlertView-Swift.h not found, I did something wrong? @Bill now I have used #import "Wow_Dictionary-Swift.h", where Wow Dictionary is my project name. Now I am getting error Wow_Dictionary-Swift.h not found. Still something wrong? @Aamir Actually, it's the target name, not the project name. Let me update my answer. @Bill my project name is same as target name. Do you have to import it in your .m file? This auto-generated file is now called TargetName-Bridging-Header.h though? @lelelo No, that file is the opposite of this one. The bridging header is written by the developer and lets you bring Objective-C and C symbols into your Swift code. The Target-Swift.h file is automatically generated and lets your Objective-C/C code access Swift symbols. @Bill sorry to bother you but I have been trying to import the Swift header file but couldn't succeed. The issue is that I have 2 targets in my project. One of the Objective-C files requires to access the Swift header files of both the targets. How would I go about that? Hi @Adeel You can create a new header file that #import's Target1-Swift.h and Target2-Swift.h and import that header into your Objective-C files. In the newly created header file it doesn't let me include either of the two. Moreover, if I exclude the objective-c file from one of the targets then the compiler stops complaining about the header file but starts complaining about one of objc class's subclass because that is included in both the targets. I found a new way to find the correct generated header file name: go to your target -> Build Settings -> Search keywords Objective-C Generated Interface Header Name, bingo! Changing the value of Defines module in Build settings to Yes is what fixed things for me! @jose920405 let me know what step you are following because the same steps for same Xcode version is working for me. MyFramework here is the "Product Module Name" build setting (PRODUCT_NAME = MyFramework). Simply adding #import "MyFramework-Swift.h" won't work. If you check the built products directory (before such an #import is added, so you've had at least one successful build with some Swift code in the target), then you should still see the file MyFramework-Swift.h in the Headers directory. Search for "Objective-C Generated Interface Header Name" in the Build Settings of the target you're trying to build (let's say it's MyApp-Swift.h), and import the value of this setting (#import "MyApp-Swift.h") in the source file where you're trying to access your Swift APIs. The default value for this field is $(SWIFT_MODULE_NAME)-Swift.h. You can see it if you double-click in the value field of the "Objective-C Generated Interface Header Name" setting. Also, if you have dashes in your module name (let's say it's My-App), then in the $(SWIFT_MODULE_NAME) all dashes will be replaced with underscores. So then you'll have to add #import "My_App-Swift.h". Better than the approved. The dashes wasted 20 min I'll never get back haha. Importing Swift file inside Objective-c can cause this error, if it doesn't import properly. NOTE: You don't have to import Swift files externally, you just have to import one file which takes care of swift files. When you Created/Copied Swift file inside Objective-C project. It would've created a bridging header automatically. Check Objective-C Generated Interface Header Name at Targets -> Build Settings. Based on above, I will import KJExpandable-Swift.h as it is. Your's will be TargetName-Swift.h, Where TargetName differs based on your project name or another target your might have added and running on it. The forward declaration (@class) of the class is a very good point! Thanks! This works like a charm if we installed swift-made library through Cocoapods. Upvoted !!! You can only import "ProductName-Swift.h" in .m files. The Swift files in your target will be visible in Objective-C .m files containing this import statement. To avoid cyclical references, don’t import Swift into an Objective-C header file. 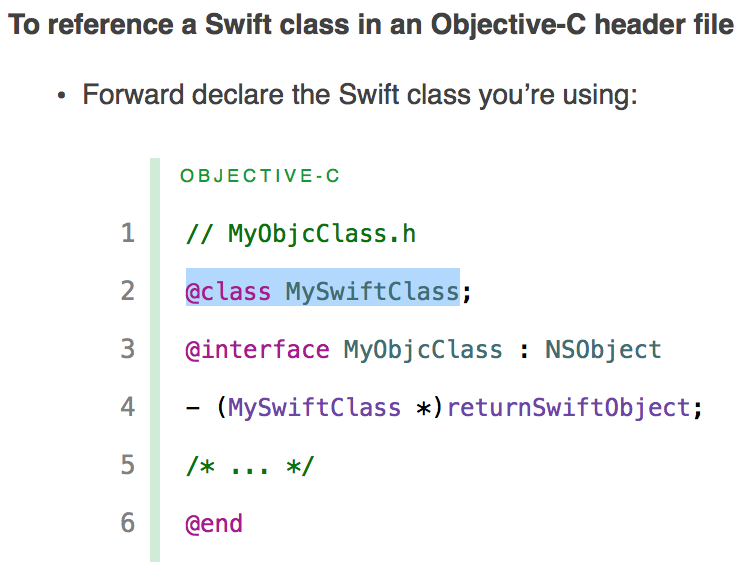 Instead, you can forward declare a Swift class to use it in an Objective-C header. Note that you cannot subclass a Swift class in Objective-C.
Only import "ProductName-Swift.h" in .m files helped me. Adding same in .pch file was giving "Cannot find protocol declaration for 'CLLocationManagerDelegate'; did you mean 'NSLayoutManagerDelegate'?" Not working with .mm file? What if you want import a Swift extension? The missing module was my issue for a test project. Furthermore, if your project name starts with a numerical, (eg, 1234.xcodeproj), it too will replace the first offending character with _, thus your module name will default to "_234" and thus your include will look like "_234-Swift.h". "Note that you cannot subclass a Swift class in Objective-C." Thank you for including this, it saved me from going crazy. Showed me this error: 'SCLAlertView-Swift.h' file not found. Needs to be the project name, not the filename - see my answer. Thanks for the documentation link. That was useful for reference.